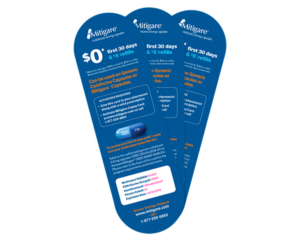 Mitigare® True Blue Savings covers branded colchicine capsules and authorized generic colchicine capsules. Mitigare® (colchicine) 0.6 mg capsules are the only capsules indicated for prophylaxis of gout flares in adults. When you receive a brand-specific Mitigare® prescription, you have the option to substitute with authorized generic colchicine capsules. Keep in mind, non-capsule versions of colchicine cannot be substituted when a prescription is written for Mitigare® capsules. COMING SOON: 30-count bottle for ease of dispensing. 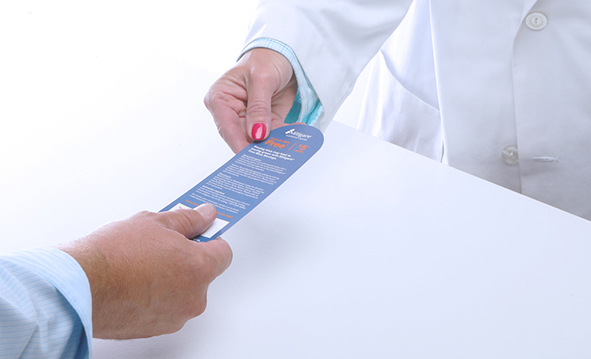 Download the updated Mitigare® Pharmacy Sell Sheet. Don’t forget to replenish your inventory of Mitigare® (colchicine) 0.6 mg capsules and authorized generic colchicine 0.6 mg capsules. Adults living with gout will appreciate this affordable gout flare prevention option. *For all eligible patients 18 years or older who are legal residents of the United States or Puerto Rico. First 30 days are free only for eligible patients. Maximum savings of $65 on the first fill and $50 on refills. Review the Terms and Conditions and eligibility requirements. Take a closer look at the True Blue Savings program.